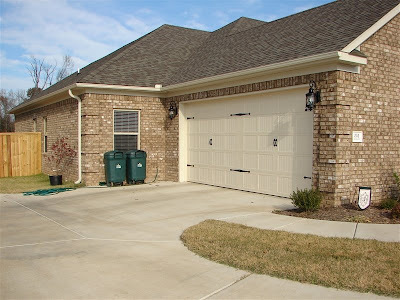 Today let's take a look at the garage and some outside shots of the house. 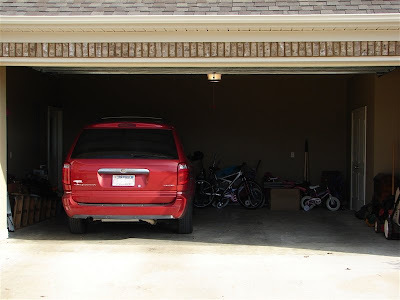 We'll start the tour going out into the garage from the house. Those two doors across the way is to our closet. It's full and we're in need of some serious garage organization system. Hopefully this will come soon. A lot of stuff that is in here can be hung up or put on a shelf. We have most of the boxes unpack and we've been able to park two cars in here most of the time. 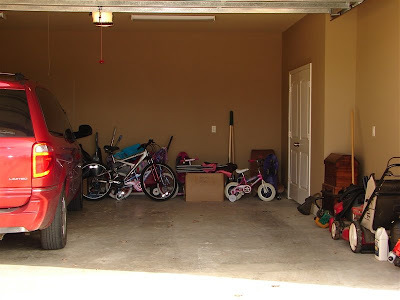 What we need now is some serious garage organization systems. Here is a view back towards the door that takes you into the house. 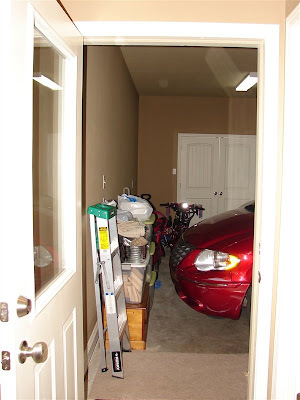 A look into the garage from the driveway. Nana's green bug is missing from the picture. It stays inside with the van. In this photo you get a little better picture of the closet. This closet has one of the large arch top windows in it. We installed blinds on the window and keep them closed all the time. The original plans didn't have a closet here, we added it to give us more storage space. There are shelves on either side of the window. I have my cropping tables and chairs stored in here. It's a great space for them! 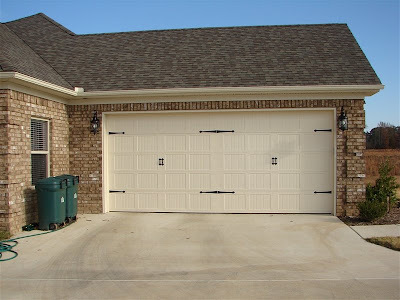 And now a view of the garage with the door closed. I love the garage door. There isn't a door in our neighborhood just like it. There are several similar ones, but not one just like it! That window there by the trash cans is Rachel's bedroom window. Moving back just a bit and you can see the side of the house. 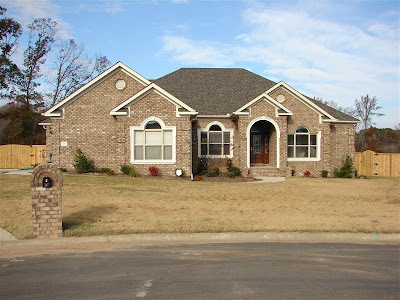 Those two windows there on the side are Rebekah's bedroom windows. Another view of the side of the house. You can see the extra parking pads we have there. This is where Jon Paul parks and is also a great place for us to back into out of the garage so we can pull straight out of the driveway. 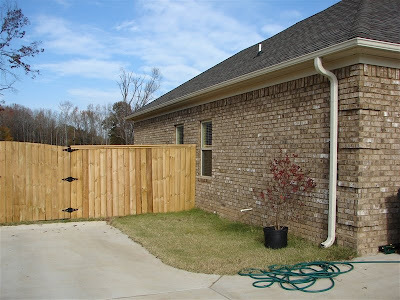 At the end of the parking pad, there is a double gate that leads to our backyard. 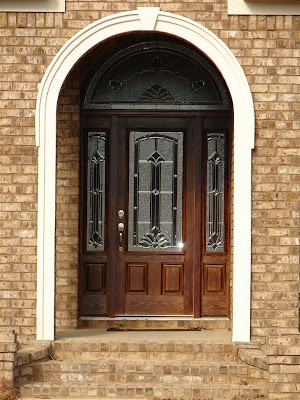 Ahhh, the beautiful front door. The door we waited and waited for. Isn't it just beautiful? I love it! And now, here is our home. An outside view of the whole house. It's not perfect, you can see that the EIFS is torn off the window on the right. This is the leak area. It's hopefully going to be all repaired soon. I'll have to post a new photo once everything is the way it should be! Tomorrow we'll take a look around the backyard and the back of the house. So, stick with me for one more day. I'll see you soon! LOVE it! 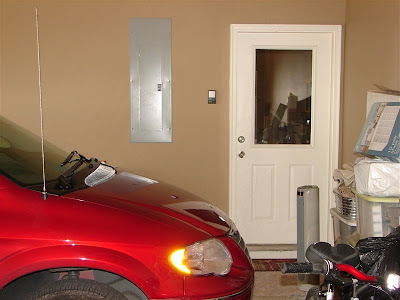 A closet in your garage. Interesting, but totally functional and smart!